The Facebook Bluetooth® beacon recently became available to the public. The idea behind the beacon is to provide customized suggestions for places to go within one’s surrounding area. ‘Place tips’ are customized based upon one’s Facebook friends, upcoming events, and advertisements from businesses that have a Bluetooth® beacon. Whether a person is on vacation or in their hometown, this Facebook feature can help enhance their experience in and around the city. The beacon allows your business to attract a new clientele of people… and it’s easy to do. Facebook shared that the beacon was tested by multiple businesses in numerous locations and results were encouraging. Businesses that adhered to a set of guidelines given to beacon users by Facebook saw an increase in street traffic. As a business owner, you can Request a Free Beacon. Facebook is giving them out to small and medium-sized businesses all over the country for free for an unknown period of time. In order for the beacon to rank your business highly, which is how you’ll get the most publicity, your Facebook account has to be current and active. This means the more friends, posts and pictures your business has, the better. Currently, this feature is only available to iPhone users with a 4S or later. But considering how quickly technology advances, the Android won’t be far behind. 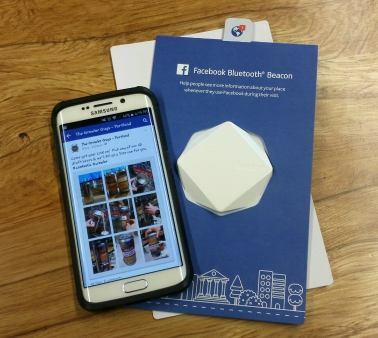 Hurry and get your Facebook Bluetooth® beacon and start boosting your business visibility! Next article: Come Swivel With Us!